1. Wigan are off the mark - well, back to the mark at least - after a satisfying and encouraging victory. Adrian Lam saw signs of the style of performance he wanted, with plenty of ball movement and varied attacking passages - even if he labelled it a "six or seven out of 10" attacking performance. Yes, Wigan were scratchy at times and yes, they will need to improve next week - there were several loose spells which would be ruthlessly punished by a better side. 2. 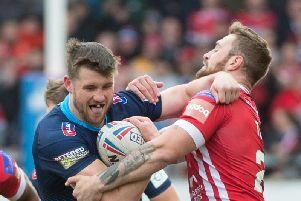 This boosted their confidence ahead of the World Club Challenge. There was little mention by the players of the showdown with Sydney Roosters before this match, but the last thing the Warriors needed was to stumble into that contest with major areas to address. On Friday night, there were smiles all round, not least in the front-rowers club, where Ben Flower doubled his tally for the season to two, Gabe Hamlin had another fine outing from the bench and Joe Bullock marked his home debut with a barnstorming try. Incredible to think he used to be a winger. What a shrewd signing he has already proved to be. 3. George Williams, take a bow. Lam said from the outset that the England half would benefit most from his coaching, and it appears it could be a match made in heaven. He created one try, for Joe Greenwood, with a short kick but was at his dangerous best when attacking the line, and it was his wonderful try - all footwork and raw determination - which really secured the win, before a late exchange of tries. 4. For the champions' home opener - against Leeds - the attendance of 11,230 was poor. Perhaps non-season ticket holders were keeping their money for next week's World Club Challenge - the Warriors have made no secret of the fact they want a sell-out. Wigan put on a slick show pre-match and at half-time which included an Oasis tribute band, and it was disappointing more didn't turn out. As an aside, perhaps the Warriors should add black outline to the gold numbers and names on the back of the shirts - to say they are difficult to read is an understatement. 5. Leeds were more direct than the previous week's loss at Warrington. Their performance had plenty of effort but they didn't have the execution to go with it - too often offloads and passes either went to ground, into touch or were knocked on. Of their three high-profile recruits, Tui Lolohea caught the eye with some lively interventions. The Rhinos look like a team in transition and it is too soon to predict how this campaign may unfold but, for now, they just need to shake the monkey off their back and get their first win.